meteorologists, the supposed subject matter experts. Similarly, a number of changes have occurred within the financial services industry that has prompted a comparable level of mistrust towards industry professionals. Underpinning these events is the concept of asymmetric information, or an informational imbalance between parties, which is not a newly occurring phenomenon when it comes to financial services. This information disparity has been long discussed within the context of economic theory. In simple terms, the service provider takes advantage of an information gap versus the client for their own interests. When combined with more recent ‘atmospheric’ shifts including financial repression by Central Bankers, rising demands on organizations’ financial resources and the investment industry successfully selling high cost and complex solutions, a perfect storm is created. Not unlike the reported rise in global temperatures, most of these shifts in markets have been subtle and occurring over an extended period of time. This is an enormous challenge to an asset owner’s ability to enact a sustainable investment program. Compounding the impact of these difficulties is an environment where asset owners have few advice providers to rely on, as the universe of reliable, consultative partners has winnowed and investment committee participation continues to decline. Though the effects from Mother Nature cannot be fully controlled, asset owners have the ability to take greater command of these market forces and better manage the fate of their institutions. At the root of the issues facing investors is an information imbalance which has been well-documented and centers on the function of markets as a ‘Losers Game,’ famously described by Charles Ellis. The concept of investing as a zero-sum game has been evident for years in active manager performance, and at the heart of this is agency risk or the principal-agent issue as a misalignment of interests and incentives. Over the trailing five-year period, as of year-end 2017, 84.2% of large-cap managers, 85.1% of mid-cap managers, and 91.2% of small-cap managers underperformed their respective benchmarks. It is true that for several periods throughout recent history investing was often a ‘Winner’s Game’ but, these environments tend to self-correct with crowding. Further, in years past there were ‘networks of information’ and less regulatory scrutiny where active managers were able to capture a performance edge. More recently, markets have evolved and information and technology has proliferated, reducing the performance advantages that once existed. Even the asset managers recognize the difficult environment; otherwise we’d likely see a more prevalent move to offer performance-based fees for publicly-listed investments. A similar phenomenon is occurring in private markets, as well. It is widely reported that valuations are stretched and deals are hard to come by. Yet, there is over $4T in ‘dry powder’ capital waiting to be deployed by investors. The end result will likely be non-differentiated performance, while the investment manager continues to pocket generous fees. This is a clear example of the agency risk issue, where advisors or money managers are putting their interests (i.e., fee income) over the interests of the institution or client. Their sole focus is on obtaining sticky assets and garner fees, with the knowledge that it will be nearly impossible to invest that amount of funds profitably. Further perpetuating this information disadvantage is that the greater world (inclusive of investment committee members) is increasingly motivated by short-term results. In a 2013 survey of global board members and corporate executives, conducted jointly by the Canada Pension Plan Investment Board (CPPIB) and McKinsey & Co., “… 63% of the respondents noted that pressure to increase short-term results had increased over the previous five years.” More importantly, the survey revealed that “… 79% of respondents felt especially pressured to demonstrate strong financial performance over a period of just two years or less.” This is reflective of a vicious cycle, in this age of information, where the 24/7 dissemination of news and information pressures asset managers and corporations (and even meteorologists) to frequently deliver less meaningful results. Another facet of this perfect storm contributing to the challenges faced by asset owners is the narrowing universe of advisors that are truly independent. Following the global financial crisis, and with the increasing complexities of financial markets as noted above, asset owners have shifted towards outsourcing the fiduciary responsibilities of their investment portfolios. As a result, the Outsourced Chief Investment Officer (OCIO) business has surged over the last decade, and traditional investment consultants have become a growing segment of that market (via expansion or re-purposing their internal capabilities to serve the OCIO market), as a way to supplement an otherwise low-margin business. These formerly independent advisors have moved into the role of asset manager, and the ability of those same firms to offer impartial advice has become increasingly blurred by conflicts of interest and a lack of transparency. As concerning, many global financial services firms have also witnessed the growth opportunity and thrown their hats into the ring. These large firms are hired (often based on a brand name) to provide an oversight function for their investor clients, but are themselves offering competing investment products which compound the misalignment of interests. These transitions only further perpetuate the principal-agent problem and information disparities. Lastly, beyond the short-term focus and the shrinking universe of objective advice-givers, is the declining involvement among investment committee members, many of whom serve in a volunteer capacity. 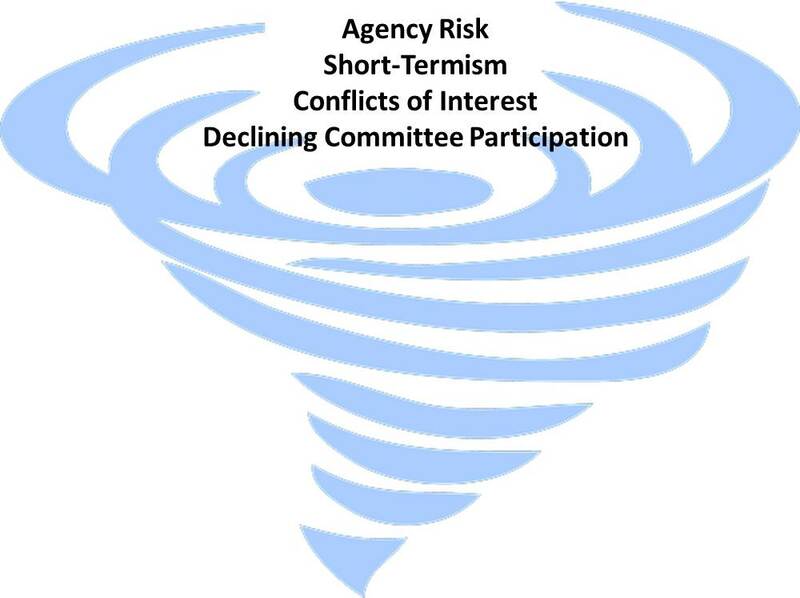 As long-tenured committee members transition away from their commitment, an information gap may form if the proper governance, policies, and education efforts are not implemented and sustained. Not unlike the perils of short-termism on portfolio performance, a lack of continuity among members may place strains on the knowledge base of an institution. Moreover, as investment programs add complexity, committee participants may face uncertainty about their oversight responsibilities, and be unaware of what might constitute success for the institution. With all these headwinds converging to form a perfect storm for asset owners, what is the solution? As suggested by Ellis, the secret to winning a Loser’s Game is to “not lose.” And, the best way to accomplish that is by concentrating on the long-term view and the needs and objectives of your institution. In the same vein as making efforts to curb carbon footprints to combat rising temps, asset owners have a responsibility to be pro-active by putting measures in place to control these information asymmetries and focus on sustainable, long-term goals. Equally important, in an industry where trust is a valuable commodity, is the ability to identify a partner to help navigate this environment with the best interests of the institution in mind, over the long-term. Recognizing a need to involve additional resources is imperative. At a minimum, there are a few obvious areas where the input from an objective third party can add value to asset owners and investment committees in their decision-making process. The first such area, as highlighted previously, is the zero-sum game of investing. As noted by Burton G. Malkiel in 2013, “… Actively managed funds of publicly traded securities have consistently underperformed index funds, and the amount of underperformance is well approximated by the difference in fees charged by the two types of funds.” Often times the perplexing behavior of investors to continue to pay excessive fees for lackluster performance can be attributed to investor overconfidence and successful marketing via the asset management industry. A trusted advisor can provide measured guidance on how to navigate these issues, including determining the most appropriate allocation of an investment expense budget to passive vs. active mandates. Another area a trusted advisor can provide assistance to asset owners is in guiding investment committees away from the propensity towards short-termism and instead focus on long-term objectives. An example of this would be providing education around the performance impact of staying invested during turbulent markets. Morningstar-published data revealed the value of a $100,000 investment in the stock market during the period from 2007-2016. By February 2009 (the trough of the global financial crisis), the value of that investment would have dropped by nearly half. However, if the investor remained in the market over the next 82 months, the value of the portfolio would grow to $195,719. Conversely, if the investor had exited at the trough, for one year, and then re-invested for the same duration, the portfolio value would be $127,517. Alternatively, a move to all cash at the bottom of the market would have yielded just $54,580. Offering opportunities and information to help educate investment committees on these nuances can be a valuable component to the long-term success of an institution. These decisions can have a meaningful effect on the longevity of an institution and a measured approach, borne of experience, can help mitigate common pitfalls. Likewise, while diversification is an important feature for investment portfolios, as the lines continue to be blurred in the context of advice-givers, there is a tendency for investment programs to over-diversify by hiring too many asset managers. This can occur as a way to reduce risk, occasionally to satisfy political relationships, or for an OCIO to offer its own in-house products. Unfortunately, this over-complication often occurs as a means for advisors to hone their narratives and embellish another aspect of their storytelling, typically at the expense of portfolio returns. Importantly, investment advisors will get paid, regardless of the performance results or the number of managers within a portfolio. 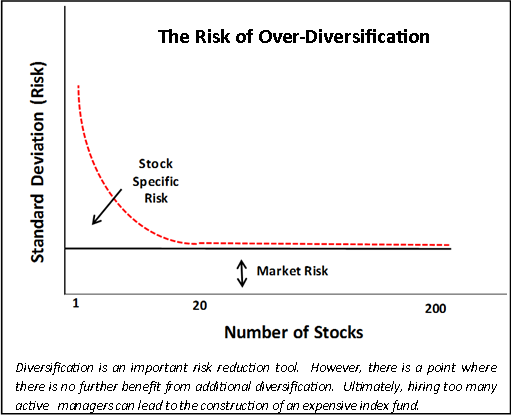 A recent CFA study shows that, among public equities, “Excess diversification can cause the overall level of active risk to decline to such a level that achieving expected return targets may prove unrealistic.” As such, hiring too many active managers can ultimately lead to creating an expensive index fund. Again, these are situations where a non-conflicted counselor can assist committees in adhering to the policy guidelines put in place by the institution and implement a selective portfolio of best ideas. As technology and the availability of information have become pervasive, markets and service providers have faced increased competition and created blurred lines about their ultimate intentions. In this environment, it has become imperative that non-conflicted advice is required from the parties providing counsel on how to manage the assets of an institution. As an asset owner or someone who represents an owner, there are several questions that are likely to come to mind. Does your trusted advisor benefit from offering internally managed investment solutions; are they working to gather assets for fee income; do they answer to public shareholders? A true partner will signal, without reservation, the intent to remain solely in an advisory capacity. Often, the relationship becomes mutually beneficial, as competent advisors experience organic growth of their business through referrals from existing clients. These firms are not reliant on catchy marketing slogans or dependent on brand-name recognition; instead, they rely on the institutional networks in which they operate. 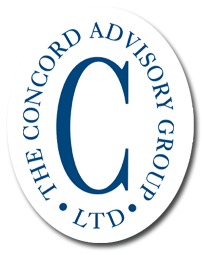 As asset owners face a perfect storm of challenges and complexities in the current market environment, it is prudent to partner with a firm that prides itself on providing a professional consultative service with a long-term view. 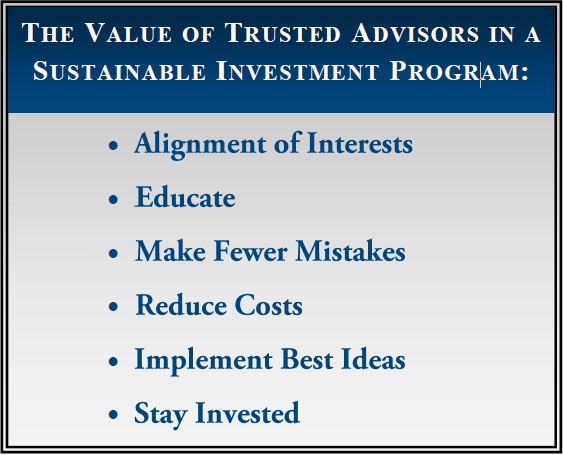 A trusted partner can aid in avoidance of the long-standing agency risk issue and instead be an invaluable tool in advising asset owners via a shared mission, culture, and philosophy that is focused on implementing a sustainable investment program designed to weather the coming storms. Bailey, Jonathan, Vincent Berube, Jonathan Godsall, and Conor Kehoe. 2013. “Short-Termism: Insights from Business Leaders.” Canada Pension Plan Investment Board (CPPIB) and McKinsey & Company. Barton, Dominic, and Mark Wiseman. 2014. “Focusing Capital on the Long Term.” Harvard Business Review. Ellis, Charles D. 1975. “The Loser’s Game.” Financial Analysts Journal. Ellis, Charles D. 2011. “The Winners’ Game.” Financial Analysts Journal. Baker, Craig. 2015. “Conflicts of Interest and Agency Issues.” Towers Watson. 2013. “Blurred Lines Between Consultants and Asset Managers Most Pronounced in the UK.” AI-CIO.com. Malkiel, Burton G. 2013. “Asset Management Fees and the Growth of Finance.” Journal of Economic Perspectives. McKay, CFA, Shawn, Robert Shapiro, CFA, and Ric Thomas, CFA. 2018. “What Free Lunch? The Costs of Over Diversification.” Financial Analysts Journal. Shah, Sunit N. 2014. “The Principal-Agent Problem in Finance (a summary).” CFA Institute Research Foundation. Soe, CFA, Aye M. and Ryan Poirier, FRM. 2017. “SPIVA®U.S. Scorecard.” S&P Dow Jones Indices. Todd, Rich, and Wendy Dominguez. 2012. “The Good and Bad of Investment Committees and Boards.” Pensions and Investments.